Pancreatic cancer treated with GVAX primes the tumor, upregulating IDO1 and PD-L1 pathway expression. (A) IHC staining of IDO1 expression in PDACs from patients treated with (n = 21) and without (n = 21) GVAX therapy. (B) Analysis of IDO1 IHC expression of total tumor area in PDACs treated with GVAX compared with untreated tumors, with an identified subset expressing IDO1 highly in the GVAX-treated group. (C) Gene expression of IDO1 measured by microarray was compared between microdissected lymphoid aggregates from 16 tumors grouped according to overall patient survival (OS > 3 years vs. < 1.5 years). 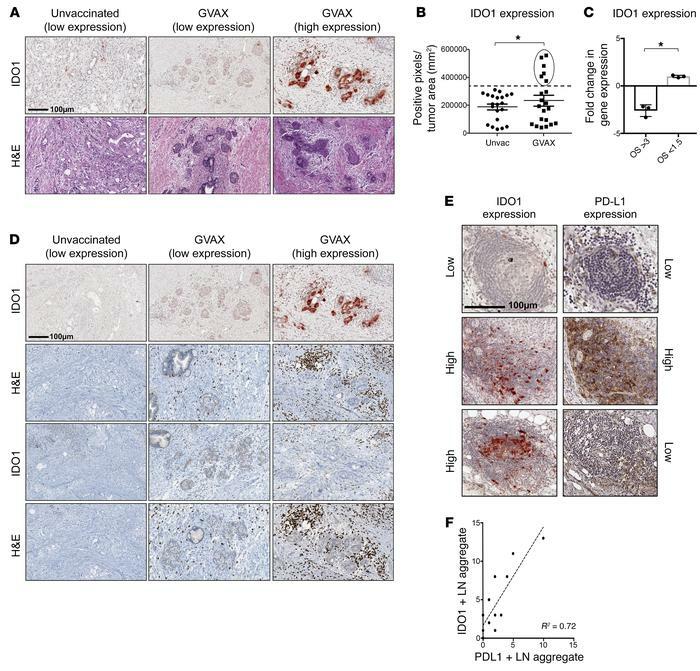 (D) IHC staining of IDO1 expression and immune cell infiltration of CD3+, CD4+, and CD8+ cells in PDACs treated with and without GVAX therapy. The same representative sample in A is utilized again here. (E) IHC representations and (F) graphical comparison of IDO1 and PD-L1 lymphoid aggregate expression by IHC following GVAX treatment (n = 16). If IDO1 expression is not upregulated, PD-L1 expression is not detectable. If PD-L1 expression is upregulated, IDO1 expression is upregulated. In some cases, IDO1 expression is increased but PD-L1 expression remains low. *P < 0.05 by unpaired t test. Scale bars, 100 μm.